Kovalev, who largely blames his former trainer John David Jackson for the shortcomings that lead to his stoppage loss to Ward last July, has been under the tutelage of Abror Tursunpulatov for his last two fights, and stated in an interview with ESPN that he is “writing the next chapter of my boxing career.” Kovalev is not the first fighter to make such bold claims in the wake of a trainer swap, but perhaps the Russian isn’t seeing the full picture. 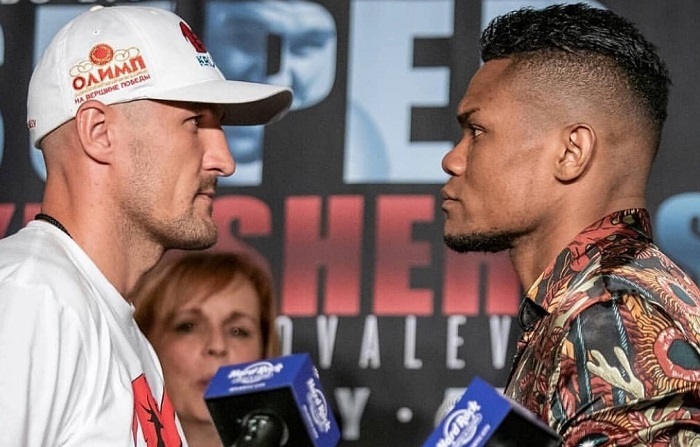 At 35, it is questionable as to how much age may inhibit Kovalev’s ability to catapult himself back to the top-spot at 175, especially with the rise of such light-heavyweight talent in Dmitry Bivol, Oleksandr Gvozdyk, Artur Beterbiev, and, of course, Eleider “Storm” Alvarez. 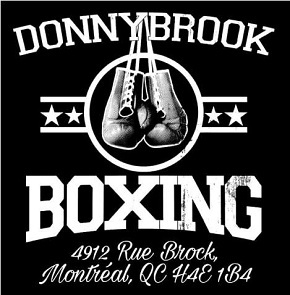 Alvarez, hailing from Columbia but fighting out of Montreal, has not enjoyed the same illustrious career that Kovalev has as a professional. Both debuted within a month of one another in 2009 and both are within a year in age, but it is Kovalev who comes in regarded as the seasoned pro while Alvarez carries the moniker of upcoming 175-pound contender. 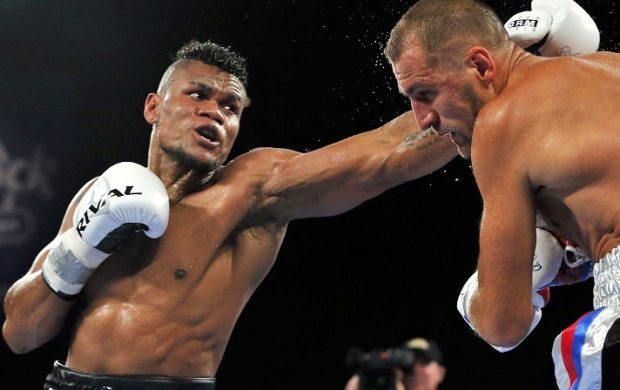 Like Kovalev, Alvarez has also been deprived of a big-money opportunity to face long-time WBC 175-pound champion Adonis “Superman” Stevenson, with the “Storm” waiting in the shadows of the light heavyweight division while fighters such as Bivol and Artur Beterbiev have won titles with nearly half his experience. For Alvarez to capitalize on his first opportunity on the big stage, all agreed he needed both a sturdy chin and much more tenacity than he showed in his decision win over Jean Pascal last year. Some pundits pointed to Alvarez having been inactive for 14 months as reason to doubt the challeger’s worth, whereas Kovalev has scored knockouts over Igor Mikhalkin and Vyacheslav Shabranskyy in the last nine months. Both Kovalev and Alvarez looked fit and ready at the weigh-in, coming in at 174 and 174.4 pounds, respectively. 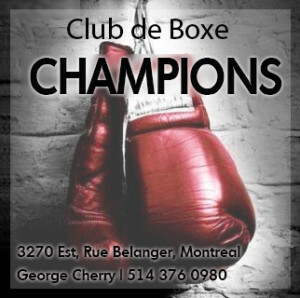 Talk was the winner would be slated to face the winner of the co-main event between WBA champion Dmitry Bivol and Isaac Chilemba and more than a few were already talking up a Kovalev vs Bivol showdown. 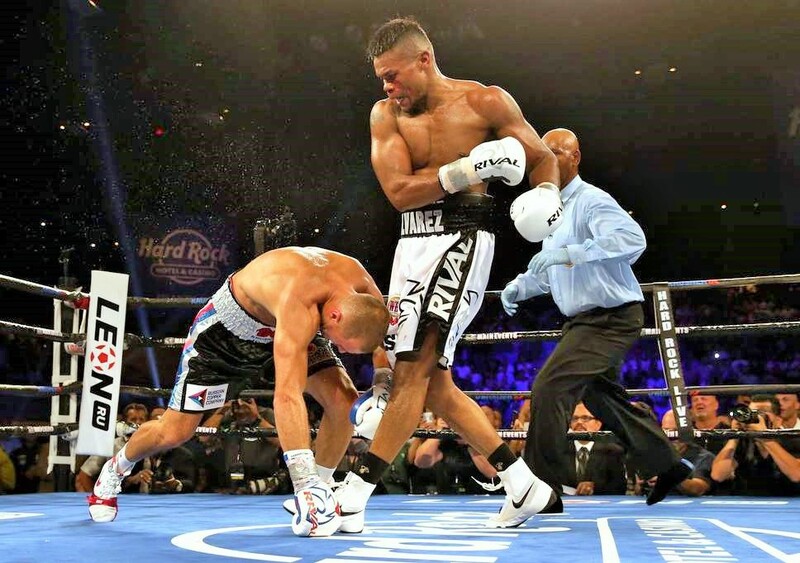 Following an uneventful co-feature with Bivol cruising to a unanimous decision over 12 rounds, a lot rested on Kovalev and Alvarez to reinvigorate the sell-out crowd at the new Hard Rock Casino in the first major boxing event in Atlantic City in nearly four years. With Kovalev and Bivol’s teams already negotiating a unification match for December, it was up to the “Krusher” to remind fans why a fight between him and his fellow Russian was considered one of the most intriguing match-ups in the sport. 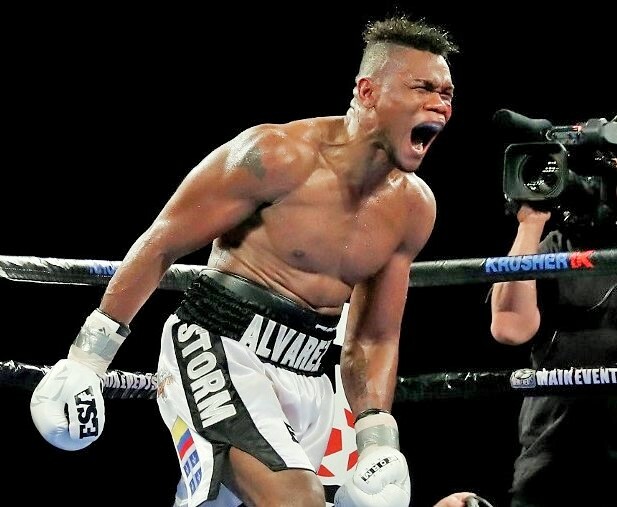 However, Eleider “Storm” Alvarez had other ideas. Early on, Alvarez looked very focused and determined to keep the fight at a distance, circling around Kovalev behind the jab despite looking like the bigger, stronger man. 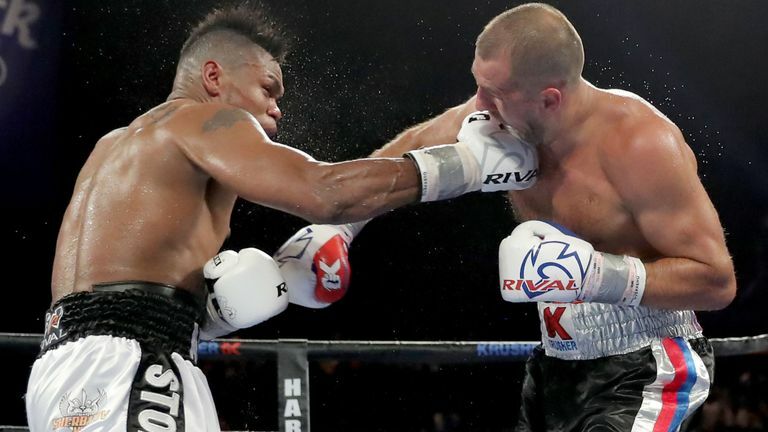 The second round saw the challenger taking more initiative, snapping Kovalev’s head back with the jab and connecting with the right hand in exchanges. It appeared that Alvarez’s stiff jab and footwork were limiting the champion’s punch output, who has been accustomed to throwing upwards of 50 punches per round. 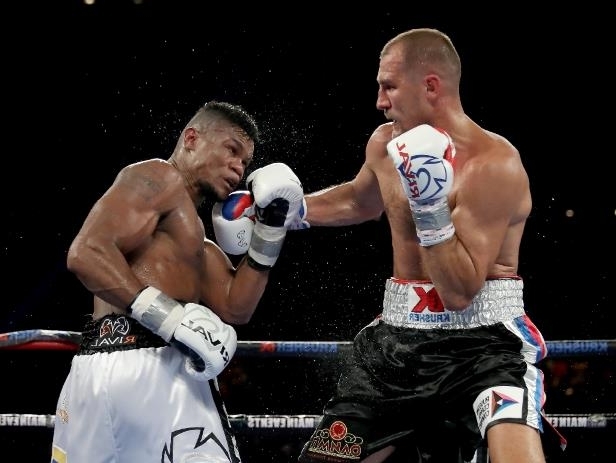 It wasn’t until the fourth round that Kovalev really began to open up. About a minute into the round, the Russian scored with a looping right hand around the guard which briefly stunned Alvarez, emboldening the “Krusher” to let go with an assortment of punches which kept the challenger on the defensive. Alvarez nevertheless did not appear the least bit discouraged, succeeding in taming the champion behind the jab and thwarting Kovalev’s initiative. A hard right hand by Alvarez to punctuate the round showed Kovalev that the challenger was still in there and a clear force to be reckoned with. The pace slowed in the fifth and sixth, with Alvarez working almost exclusively behind the jab and using an occasional left hook. The challenger was very picky with his punch output, seemingly content to go long stretches without engaging if the right opportunities didn’t arise. Despite each round exhibiting close competition, Alvarez trailed on all three scorecards (59-55 twice and 58-56) heading into the seventh. Matters appeared to be going in the Russian’s favor until he found himself on his back following a thunderous right hand that sailed over his low left hand. 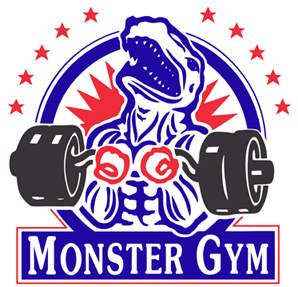 Hitting the canvas for the first time since Blake Caparello scored a flash knockdown against him four years ago, Kovalev got up on fatigued, unsteady legs. 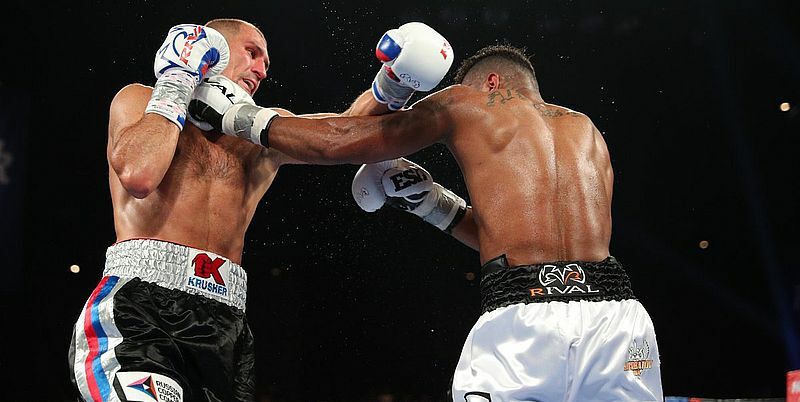 Alvarez patiently went in for the kill, using the jab to set up the finish as Kovalev appeared helpless on his feet. With 40 seconds left in the round, Alvarez connected with a brutal left hook-right hand combination that floored Kovalev for the second time in the fight. 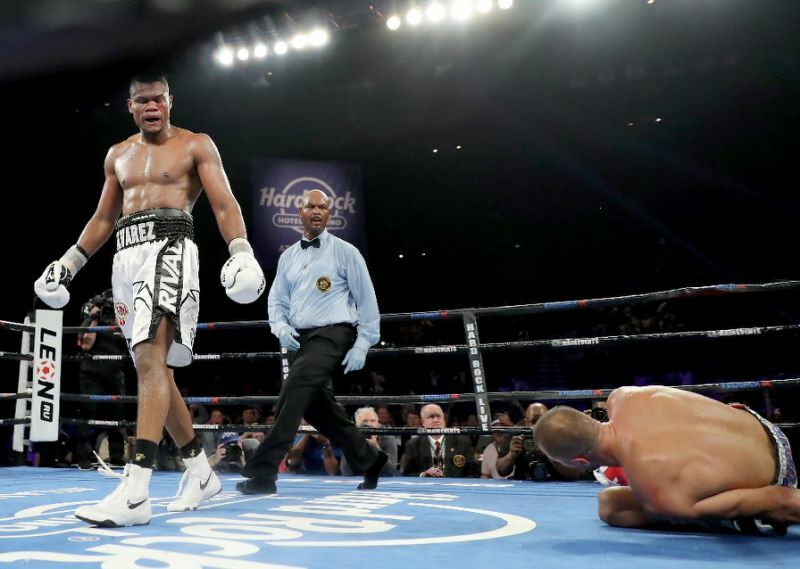 Kovalev got up, albeit on unsteady legs, and referee David Fields allowed the action to resume until another right hand by Alvarez floored the champion for the third and final time. Wow. Talk about a way to upset the Kovalev-Bivol applecart. At an absolutely critical turning point in his career, the Canadian not only seized the moment to become the WBO light heavyweight champion, but also sent shockwaves through a star-studded division by demolishing a fighter many still regarded as one of the biggest pound-for-pound punchers in the sport. Kovalev, who has a rematch clause, neglected to attend the post-fight presser, instead informing the boxing world via social media he was on his way to the hospital while thanking his fans for their support. Kovalev’s trainer Abror Tursunpulatov suggested to a Russian media source it may be time for the “Krusher” to call it quits, but also didn’t dismiss the possibility of a Kovalev comeback by stating “this is boxing, so anything can happen”. Main Events CEO Kathy Duva stated she would expect Kovalev to exercise his right to a rematch if the Russian continues his career, citing an open December 8th HBO date as a possibility for the sequel. For the newly crowned champion, there are plenty of opportunities to look forward to if Main Events and Kovalev don’t act to enforce a rematch per the contract. The obvious move is to fill Kovalev’s shoes in a unification bout against WBA champion Dmitry Bivol who was also victorious last night, albeit in a much less impressive manner. This would come as a shake-up for Bivol’s promotional team “World of Boxing” who were in the process of working with Main Events towards a December unification with Kovalev, but it remains a possibility if both sides insist on making the fight happen. Alvarez, who became the third 175-pound titlist in the Groupe Yvon Michel (GYM) promotional team behind Beterbiev and Stevenson, would appear more likely to get a shot to unify the titles with IBF champion Beterbiev than Stevenson, given the tidy sum of money paid to Alvarez to avoid granting him his mandatory shot at Stevenson’s WBC title. Beterbiev is set to face the unbeaten, but relatively untested Brit Callum Johnson in October, and provided that Beterbiev is successful, a unification battle might be a possibility in the future. “Storm” exults in the wake of his stunning victory. I hope Kovalev retires.He’s given us fans all we could ask for.Go in good health Krusher!And thank you.